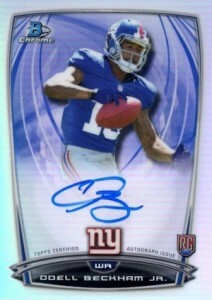 2014 Bowman Chrome Football brings the shine and signatures the brand is known for. Hobby boxes promise one autograph and a handful of Refractors in what is a fairly straightforward release. 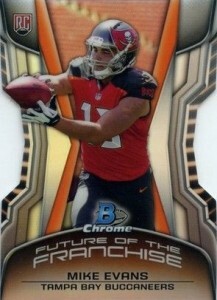 Although there were Chrome Autographs in 2014 Bowman Football, they features rookies in generic uniforms. 2014 Bowman Chrome Football fills in the logo holes, delivering new autograph cards for 75 first-year players. Besides basic Rookie Refractor Autographs, there are lots of numbered parallels: Blue (#/199), Bubbles (#/99), Gold (#/50), Red (#/25), X-Fractor (#/10), Prism (#/5), Printing Plates and Superfractors (1/1). The 2014 Bowman Chrome Football base set has 220 cards. It mixes both rookies and veterans.On top of this, 50 rookies have photo variations. Like the autographs, Refractors flow freely. Basic Refractors are inserted 1:4 packs. Every hobby box also has a Pulsar Refractor. Other than these and Black Refractors (#/299), the parallel types and quantities match up with the autographs. 2014 Bowman Chrome Football has three basic inserts as well. 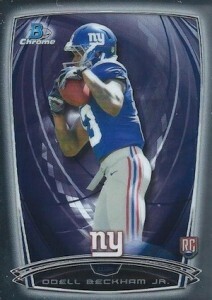 Franchise Futures Die-Cut Minis are also inserted one per box and also spotlight rookies. Gold parallels are a case hit while X-Fractors are numbered to 10. Topps Shelf Rookies focus on key first-year players. Basic versions land one per box. Die-cut parallels include Gold (#/50), X-Fractor (#/10), Pulsar Refractor Autograph (#/5) and SuperFractor Autograph (1/1). The Bowman's Best Die-Cut checklist has 25 rookies and fall two per box. The four parallels line up exactly with the Topps Shelf parallels. Although 2014 Bowman Chrome Football hobby boxes promise at least one autograph, every fourth box features a second signature card. 50 cards. Click here for a detailed guide. Good: On-card autographs, simple box layout with good card variety, Topps Shelf. Bad: Damaged cards, SP overkill, some sticker autographs. The Bottom Line: 2014 Bowman Chrome Football is a nice upgrade from the early 2014 Bowman Football release and addresses many of the negatives in the non-chromium version. The huge hits are still few and far between, but the reasonable price point and Chrome factor make this a low-end break to strongly consider. Gone are the generic rookie photos that plagued 2014 Bowman Football. While it is disappointing that some rookie players are shown in practice gear, it is still a major positive that the 2014 Bowman images were not recycled. Other than that, the Bowman design is the same except for the chromium. I personally find that the base veteran design seems to pop more with the added Chrome technology. Given that the average box yields three different inserts, a variety of parallels and one hit, in addition to the base veterans and rookies, 2014 Bowman Chrome is a well-rounded product. With nine in my box, the parallels were fairly common but did not feel overdone. Each falling one per box, Bowman’s Best and Future of the Franchise Mini inserts are both die-cuts and while I think this concept has become too customary in the hobby, the design was quality. The real winner in the insert department is the Topps Shelf cards that reappear after their debut in 2014 Topps Chrome Baseball. With a geometric background and dark colors, the cards look fantastic. Finally, there is the one autograph per box and most collectors will find a base autograph parallel. Although it would be nice if it was guaranteed to be an on-card Rookie Refractor Autograph, many are on-card, including the one in my box. I did notice more than few cards that were damaged straight from the packs. I may have just gotten an unlucky box, but it was a slight bummer. 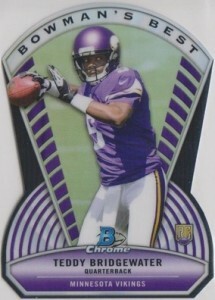 2014 Bowman Chrome Football is a largely simple product and the checklist echoes that. Despite this, it still covers all the bases collectors expect from a box at this price point. While all the major rookies are available, the rookie autograph checklist includes 91 players, so there is ultimately a lot of bloat. The short print fascination continues for 50 of the top rookie cards. While short prints don't appear to be going anywhere, 50 is a bit much. Even with the apparent rarity, most are yielding low prices and do not add much to the product. At $40-50 per box, you will be hard-pressed to find a more complete 2014 NFL product. While monetary value is not a guarantee, the collecting value is strong in Bowman Chrome. And even though boxes only yield one autograph, there are some big hit possibilities thanks to the Refractor parallels. On the other hand, the large autograph checklist means there are a lot of undesirable subjects and a good likelihood for a filler hit. All things considered, I enjoyed 2014 Bowman Chrome Football. The quality look, reasonable box price and overall variety made for a fulfilling break. Given the clear superiority over 2014 Bowman, it does make me wonder how things would have played out for Bowman Chrome FB and Bowman FB going forward if Topps had not lost the NFL license. 2014 BOWMAN CHROME TOPPS SHELF PULSAR MIKE EVANS AUTO 5 BGS 9.5 RARE AUTOGRAPH! I finally picked up a blaster box and was not disappointed at all. After all it is one of the first NFL licensed product to debut each year. Besides the blank jerseys, the cards are somewhat similar in design as of last years Bowman. For a low end product, it does the job well, just like Topps competitor Panini, head to head with Score! will this be hobby only? I dont see “(hobby only)” next to short prints/variations. I think the cards are very nice for the price..I’m just a little bitter because I haven’t pulled an ODB Jr. Auto yet, 4 boxes and counting..
Beautiful inserts, very nice. broke a case and not 1 rookies variation. disappointed there. Also, pulled a Bishop Sankey rookie with a white border, is that the variation or a misprint ?? Scott, your white bordered B. Sankey is the variation version. Another easy way to tell is the code on the back of the variation cards end with “12”. i see it now, thank you ! It’s rare in the sense that there are 75 copies. Dan, expecting anything but what’s stated on the box is a no no! As you will only keep hoping or expecting! Hope you got it! Keep on opening! eBay is waiting for the card to pop up….and I’m sure the breakers who buy 100’s of cases got mot of the goodies! The industry is going one way, IMO, down hill! Same stuff every year just new players! I give it 3 stars, the card design is very nice, plus I got some good inserts, A Teddy Brigewater Gold Refractor, and Pulsar Refractor of Deanthony Thomas. The downside is the autograph. Ive bought a couple boxes of this years Topps Chrome and for some reason they only make autos of undrafted players or 6th, 7th rounders. Can you guess who I got for the autograph in this box? No you cant cause no one has ever heard of him, Garrett Gilbert. Aso I have not received one Johnny Manziel, ODB or Bortles in 1 master box of Finest, 2 Topps Chrome boxes, or this box. Not even the regular base card, would not be surprised if one of the oompa loompas at the Topps Factory are snagging them off the assembly line, or if Topps just short changed us collectors. Good thing they are loosing thier NFL License. The product is worth it though for $40 to $50 a box. I like it! Bought a box today and was not disappointed Pulled a Bubbles refractor Auto of Jeremy Hill /99 a Blake Bortles Blue refractor /199 and a second Auto of Aaron Donald Usually there is only one! for $42 i think that that was an excellent bargain, however the chrome cards are very sensitive! and The rookie selection has some mediocre players but overall it was a fun and enjoyable box break! 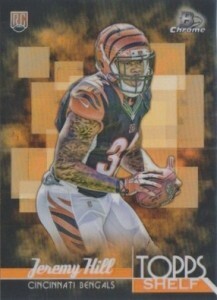 I got a Tre Mason Future of the Franchise card that is serial numbered out of 332. I didn’t even notice it at first because there is no difference between it and other ones (I actually have another Tre Mason FotF that I compared it to). It has the same refractor shine on it, no differences at all. What would this parallel be called? I read that you gave it a plus for on-card autos and a minus for some stickers…but every single auto i have gotten has been a sticker. I have bought at least 10 boxes. Chris � That stinks. I can only review what I encounter. My autograph was on-card but I knew there were sticker autographs as well. I’ve busted nearly a case of this product, 10 boxes in total and the best card I’ve pulled was a ODB Black Refractor numbered out of #299 valued at 30$. The best auto was Donte Moncrief that I actually pulled twice out of two seperate boxes valued at 20$. Also pulled an AJ McCarron auto at 15$, and a Zach Mettenberger auto at 12.50$ I’ve pulled no gold or better autos. Only non regular refractor auto I pulled was a Troy Niklaus Blue Refractor auto which was like 8$. After 10 boxes of this product, I’m still 2 cards short of the base set. I’ve pulled only one SP and it was a DaVonte Addams SP valued at 12$. And, the best non auto refractor I pulled was an Austin Sefarian Jenkins Prism refractor numbered out of #5. There’s no booking value on this card, but I’m sure it’s no more than 25$-30$. This product teased me. The first 3 boxes I bought had some good hits like the ODB Black Refractor, ODB Bowman’s Best Die-Cut, Dri Archer Red Refractor out of #15, one of the Moncrief autos, and the Addams SP. The last 7 boxes had less hits. I hit the Sefarian-Jenkins on box 5, but after that the best card I pulled was a Ryan Tannehill gold refractor at 15$, Tom Brady black refractor at 10$, but no SPs, and repeating bum autos 2 James White autos and 3 Kyle Von Noy autos. It’s like Bowman purposely put repeats in their case. If I wasn’t still trying to build the base set, I would never buy this product again. 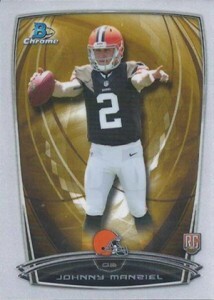 Any idea on value of a Johnny Manziel pulsar refractor autograph? 2014 BOWMAN CHROME FOOTBALL HOBBY BOX 1 RC AUTO PER BOX Jimmy Garoppolo Carr RC?